‘Digital Storytelling on the Web’, a conference, ‘Beyond KM: Delivery Value’ and a lecture, ‘Flying with Madame Butterfly: Early Japan Airlines Advertising in the US and Hong Kong’. The workshop was a pre-conference event. Alan Levine is a web educationalist; which sounds clumsy but it gives a sense of his work and interests. Alan took a small group through many websites and a few tools that could help us facilitate a digital story. All of them can be found on 50+ Web 2.0 Ways to Tell a Story. A story is the most effective communication device humans have developed. ‘When you go outside this circle of fire something is likely to eat you’, remains one of the best reasons to remain close to the tribe. A digital story is not fundamentally different from a traditional spoken or visual story. Getting the audience’s attention and holding it is still the key challenge for the storyteller. The classic Freytag story arc still applies. However, a digital story may be more mixed up, more spontaneous or more complex with connecting images, sound, text and the possibility of the audience to dynamically manipulate the story. •	The closed wi-fi internet-like environment using ‘The StoryBox’ could be used to share text, images, audio and video without having to have it all up on the web. •	Pechaflickr and Five Card Flickr could help to get people talking, and exploring how a story unfolds. They are good for storytelling practice in a second language. The Hong Kong Knowledge Management Society’s conference, ‘Beyond KM: Delivering Value’, brought together about 40 people to listen and share some stories on the slippery topic of ‘knowledge value’. Knowledge without value seems like a contradiction. One of the more valuable lessons coming out of knowledge management and into organizational practice is the importance of storytelling as a communication tool. Many knowledge managers like to emphasize that conversation is the key enabler for knowledge transfer. With that thought, we had lunch first and sat at around tables talking. This was much more useful than sitting through a morning of presentations full of coffee and sugary buns wondering what was for lunch. •	The emic/etic distinction of what people think vs. what they say must always be forefront when collecting information from the customer. •	Innovation comes out of conflict so finding that point of conflict leads to innovation. •	Perfection is not that important. Good-enough works most of the time. •	Combining machines with humans is likely going to be more effective than only one or the other approach. •	Tagging started with Assyrian clay tablets 3,000 years ago and not much has changed. •	Access, security, governance, mitigation and standardization make it highly problematic to replicate Facebook-like social media inside an organization. •	Worry about knowledge creation before worrying about knowledge management. This will solve a whole host of potential issues. •	Nothing will ever replace experience. •	Managing for the few big, important or calamitous events will always be prohibitively difficult and will likely fail. •	People are pattern recognizers not information processors. •	People blend the patterns they recognize to make a conceptual whole that has immediately useful meaning. •	5 is the number of words we will remember, 15 is the number of people we trust and 150 is the number of people we can recognize. •	Big data must have people at the centre to make it useful. I dashed back across the Hong Kong harbour to the Museum of History for the Anthropological Society monthly gathering. Yoshiko Nakano’s told the story on how two ex-GI ad-men out of San Francisco developed the geisha service for JAL (Japan Airlines) in the 1950’s that continued up to 1970. The story of ‘Flying with Madame Butterfly: Early Japan Airlines Advertising in the US and Hong Kong’, was more than just American GI’s fascination with exotic Japanese woman but also a real need to accept the Japanese as useful allies in the looming cold war. It was easier to accept a beautiful, gracious, charming and compliant geisha-clad woman over that man in the army cap and buckteeth America had been fighting only a few years previously. With advertising budget many time less than Pan Am or Northwest, these American ad-men hit on a sure winner; geisha’s in the air serving exhausted western businessmen. It worked perfectly and the concept of aircrew in national costumes has become a mainstay of the airline industry to this day. That Japanese woman working as flight attendants didn’t enjoy the experience of wearing kimono and weren’t much use in an emergency situation was ignored. The stereotypic compliant Asian woman is still with us today and owes quite a lot to these images promoted by JAL’s kimono service. Stories help us understand the world we experience and give us a view into a world that is not our own. The digital world requires we actively manage our digital personality. Knowing how to tell a digital story will help keep control of our digital personality. The digital line between inside and outside the organization remains a dilemma for anyone using social media. Linking our digital personality to its context may help delineate the line for how to use social media in our digital lives. Images are a useful marketing tool but some images promote stereotypes that are difficult to stop once entrenched. Should we control how images are used in the digital world? Telling and listening to stories, blending and reflecting on them may change what we believe is valuable and worthwhile. I went to the International Association of Facilitators Asia Conference 29-30 September in Shenzhen, China. Here is the Facebook page. The conference was hosted locally by Leadership, Inc., based in Shenzhen and organized by the IAF Asia Conference committee. It was so useful to spend a few days with 80 facilitators from across Asia and learn from them. There were 4 large group activities and 16 break-out sessions to choose from during the main 2-day conference. Facilitation is something that I learned about when I was doing my Msc in Knowledge Management at HK Polytechnic. I realized that I had ‘been facilitated’ many times over the years working in organizations. I learned some facilitation techniques in that programme and in some other workshops and gatherings over the past few years. Knowledge management is so much of the time trying to get people to have a meaningful conversation, which are both relevant to the organization and leads to sharing and exchange of knowledge. It is not easy to achieve since most of the time the typical meeting is not about a conversation between equals but rather about direction or control. That deadly PowerPoint presentation which no one listens to because they are busy watching their phones is a real-world phenomenon. All too common are neetings where no one but the lead and her chief lieutenant speak and then the real meeting happens later in small groups of 2 or 3. Frequently the consensus after the meeting is ‘we are not going to do that’. – Let people settle in their seat with the people they know, have a short conversation and then have them count off up to the total number of tables – 1 – 8 if there are 8 tables. Then ask all the number 1’s to go to table 1 and all the number 2’s to go to table 2. This gets people sitting away from their colleagues and friends but gives them a bit of comfort in the beginning. It works best in a bigger group. – Collect many postcards and spread them out on a table or the floor. Ask people to choose one postcard that best describe themselves. When people go back to their table ask them to explain to their group why they made this choice. This works well to let people reveal themselves to a small group. – Get colourful hoops of string and make circles on the floor. Ask people to gather in the hoops based on how they define themselves. Once gathered, ask them to explain how they feel. This works well when you want people to become aware of how groups exclude and include others. I learned this from Masako Arakane from Qualia, Inc. at the conference. – Pose a question or a topic and have rounds of conversations for 5 or 10 minutes were in each round the groups change. Big paper on tables can let people jot down notes but it isn’t necessary. This is a world café sometimes called a knowledge café. There are many other facilitation techniques and if you have an experienced facilitator it is of great value to use him or her to help guide the conversation process. However, you may want to try to learn some of these techniques yourself. Knowledge management success hinges on sharing, openness, flatness and transparency. If you want to have more meaningful conversations every time you have a meeting or gathering in your organization I recommend taking a look at these sites for more information. The conference participants were diverse but most interestingly there were over 20 experienced facilitators from Japan. The IAF Japan chapter has over 1,500 members. It will host the IAF Asia 2013 conference in Tokyo. As I’ve frequently noticed, Japan has a wealth of knowledge and expertise in how to work with and with-in organizations. However, sharing this knowledge with the rest of Asia seldom seems to be a priority. As someone said to me at the conference, the Japanese have a culture of listening and reaching out is quite difficult for the Japanese. This may be true but I’m never so sure about cultural pronouncements. I recommend getting to the IAF – Asia conference, 19 – 22 September 2013, in Tokyo and listening carefully. There is some excellent facilitation work going on in Japan. Back in April 2011 I went to a Birds of the Feather event sponsored by BrightIdea, see here for my posting on that event. At the event one of the examples of an innovation was the use of digital pen technology to collect information on forms by workers in the field. I didn’t know what they meant by digital pens but soon learned that it was a combination of a pen and some special paper. The pen and paper let normal handwriting be captured and transferred to a digital format without any scanning. – The handwritten form is easy to use, can be signed for authorization and can then be retained as an authenticated final copy. – The online form is difficult to use, requires a computer, a printer and a scanner and a whole lot of training. – The handwritten form is difficult to share. We have to scan it and input the data manually and then verify the input. This slows down the workflow. – We must have a printed and signed form for compliance purposes. We want a true, unchangeable authenticated copy so we will have to print the form, sign it and then scan it. The core digital pen technology comes from the Swedish company Anoto. The technology has been licensed to other companies. For example, PaperIQ Digital Pen for Blackberry solution, and LiveScribe that produces digital pens combined with digital audio recorders. In June 2011, I got in touch with Big Prairie Limited a local Hong Kong company that provide consulting services for Anoto based digital pens technology. Big Prairie has been working in the digital pen area in Asia for about ten years. In exchange for helping out at the Big Prairie booth at the Greater China eHealth Forum 2011 on 7-8 October I was given a LiveScribe Echo 4GB digital pen. I didn’t agree to blog about the digital pen technology and no one from Big Prairie has reviewed this blog. Just to be clear, I got 1 pen, 3 notebooks and some software with a retail value of about HKD1,700 (about USD220) in exchange for 2 days of work at the forum. Clearly, I’m really a cheap date. I prepared some demos and for two days I demonstrated the LiveScribe Echo digital pen. Subsequently, I’ve been using the pen almost every day and showing it around to my network. People are very impressed with the technology. The pen is a normal ball-point pen with a small camera and a digital recorder and player. The pen is lightweight and a bit big but still comfortable for writing. The pen can be used as just a normal ball-point pen or used with the Anoto dot paper to record what you are writing. The notebook is made from normal notebook paper which as been printed with thousands of very small blue-colored dots. These dots are locational markers; when combined with the camera your writing is recorded precisely and accurately. The digital recorder can be used stand-alone or it synchronizes with your handwritten notes. The notebook has printed commands at the bottom of the page that let you turn on, pause, turn off the audio recording, jump ahead in 10 second intervals, bookmark, jump to a % position, set the playback speed and adjust the volume of the playback. The small speaker on the pen is good enough for listening or you can buy some headphones that plug into the pen for both better listening quality and recording quality. You can play back an audio recording by simply touching any of the synchronized handwritten text. I don’t want to go over all of the features of the LiveScribe pen because that information is easily available and better explained on the LiveScribe website. The handwritten notes and recording can be easily exported to Adobe pdf format. This is called a pencast. I’ve made some pencast examples that illustrate what I think are the important points. Download these pencasts and open with Acrobat Reader version 9.3.2 or higher. 1. A pencast with handwritten notes and audio recording by listening to the BBC One-minute news broadcast. Pencast no 1 …. – The black text has no synchronized recording. – The green text has synchronized recording. – Click on the green text to listen to the recording. The remaining green text will go light grey. You can jump around by clicking on the green or light grey text. 2. A pencast with handwritten notes, audio and a quick sketch. 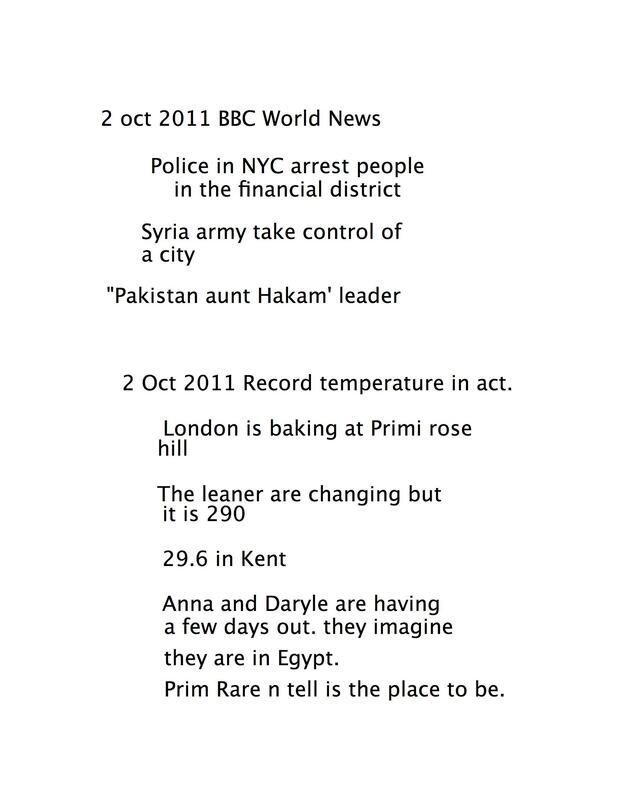 Added a few days’ later handwritten notes and audio recording from a BBC One-minute news broadcast. Pencast no 2 …. – It captures the sketch easily and accurately. – Notes and recordings can be added at different times. 3. A pencast of “Double Ninth: Missing my Shandong Brothers”, with handwritten Chinese characters, Putonghua pinyin and English translation. There is no audio recording. This is a poem that almost all Chinese children learn in school. Pencast no 3 …. At every holiday my homesickness increases. They are planting flowers, but one is not present. – Kana means katakana and hiragana writing. Kanji mean Chinese characters. Handwritten notes can be converted to text using the MyScriptforLiveScribe tool from a company named VisionObjects . It costs about USD30.00. It is very easy to use from within the LiveScribe Desktop. – As a JPG file it retains the layout and format of the handwritten notes. 2. A pencast with handwritten notes and audio recording by listening to the BBC One-minute news broadcast converted to text and then saved as a DOCX. Pencast no 6 …. – It loses the layout and the format. – The text can be edited. – The text has 401 written letters and 10 errors marked in red so the error rate was 2.49%. This is remarkable for conversion of handwritten text to type text. I did a project last year where scanning handwriting and then converting to type text the error rates was between 25% to 50%. See here for information on ICR, intelligent character recognition. 3. A pencast of “Double Ninth: Missing my Shandong Brothers”, Chinese characters, Putonghua pinyin and English translation. I’ve converted the Chinese characters to text, the Putonghua pinyin to text and the English translation to text and saved as a DOCX. Pencast no 7 …. – There are 37 characters in the original text plus 2 characters of the author’s name. There are 6 errors marked in red. The error rate is 15.38%. Once again, this is remarkable for handwritten Chinese character to type text conversion. – There are 199 handwritten letters and diacritic marks in the Putonghua pinyin. There are 29 errors marked in red. The error rate is 19.33%. It is high because MyScriptforLiveScribe doesn’t have a dictionary for Putonghua pinyin. – There are 188 handwritten letters and punctuation marks in the English translation. There are 15 errors marked in red. The error rate is 7.98%. 4. A pencast of Japanese kana and kanji. This text only has hiragana and kanji characters converted to characters and then saved as a DOCX. Pencast no 8 …. – 65 handwritten hiragana and kanji. – 3 errors marked in red. The error rate is 4.62%. Once again, this is remarkable. Projects in Japan I’ve worked on with handwritten Japanese to text conversion are lucky to get the error rate down to 25%. The LiveScribe solution is for personal note-taking. It is most useful for students, business people, professionals such as lawyers, doctors, advisors and anyone who takes notes which is just about anybody. Being able to record the audio along with the notes can significantly increase the value of the notes and can improve your ability to add to the notes later. Being able to create a PDF pencast makes the notes easy to share with others. Being able to convert them into type text makes it much easier to produce formal reports from handwritten notes. I recommend it highly for an effective and inexpensive solution for taking notes and keeping them digitally. In Hong Kong, information on ordering a LiveScribe digital can be found on the Smartpen Asia website. The LiveScribe website has an international store locator. LiveScribe pens and accessories can also be ordered thru Amazon. There are enterprise solutions enabling forms to be created and specialized workflows integrated to enterprise backend solutions using the Anoto digital pen technology. You should contact Big Prairie Limited or Anoto for more information. I went to an Education & IT Conference on 29 April here in Hong Kong. It was for the full-day and there was cross-section of education researchers from universities around Hong Kong, heads of IT Services for universities, colleges and K-12 international schools and a few others such as the CIO for the International Baccalaureate program. The focus was on how to use technology in schools and what works and what doesn’t work. There was a lot of discussion on the disconnect between what technology skills and equipment students bring with them into the classroom versus what technology a school and/or teacher can reasonably be expected to provide. The word ‘digital native’ popped up many times with various feelings on if they exist and what they may or may not be able to do with technology. Clearly the feeling was that young people are frustrated with ‘how they learn’ and they ‘want to be more engaged’. There were many examples of students using video and audio to create content for assignments collaboratively. There was a need to change the physical setting of the classroom to make it easier for students to interact and collaborate. Many times it was mentioned that teachers needed to learn how to teach using more collaborative processes and not be intimidated by technology. The process of getting teachers to learn more collaboratively among themselves was a theme repeated over and over. My perspective on learning and teaching is that in the past 5 years I’ve been in student in 3 different full-time learning programmes. I think this is a bit unusual for someone my age. I got the typical mid-career corporate lay-off in 2007 and at the age of 51 I decided I would re-train and do something new. This is a cautionary tale on teaching old dogs new tricks. I was an unqualified English teacher in at the Beijing Second Foreign Language Institute, 1988-1989, and in Hong Kong at the Sear Rogers International School, 1989-1990, and I rather enjoyed it although I had no idea what I was doing in the classroom. So, in 2007 I enrolled in the Hong Kong British Council Certificate in English Language Training for Young Learners offered jointly with Cambridge University. There were 9 students and 2 teachers. We had a few weeks of lectures and then we started actually observing and teaching. During the lectures we sat at 2 round tables in well-appointed rooms with very fancy ‘interactive white-boards’ which integrated with presentation software, video and audio files. The teachers were sort of OK with using it but frequently complained on ‘how hard it was to use’. We did some observations of real classes at the British Council and they all used the ‘interactive white-boards’. Teachers had a wide range of user skills and techniques. Recently I’ve done some research of the British Council and I notice there is a thread these ‘interactive white-boards’ were expensive and not that well taken up in many cases. I finished the programme and got my certificate and in no-way felt qualified to go-out and teach anyone English. I was mostly just shell-shocked and exhausted. Almost 4 years later I can say that I’ve not made any significant use of my English language teacher training as a teacher. I tutored a few Japanese students the next year when living in Japan but nothing since then. However, this experience gave me many insights into the learning process. Sitting and working collaboratively was very useful for the course whereas the fancy ‘interactive white-boards’ were not that critical to the learning process. Next I moved to Okazaki, Japan to study Japanese full-time at the Aichi Center for Japanese Studies, more commonly known as ‘Yamasa’. I had been studying Japanese with a private tutor for about a year so I had some back-ground. I was in a class of 12 from 9am – 4pm Monday to Thursday and Friday 9am – 2pm. I also had one-on-one private tuition 3 times a weeks. Ten of my classmates were ‘digital natives’ all under 23 years old. There was one woman in her mid-thirties. It was a very international group; UK, USA, China, Hong Kong, Taiwan, Sweden, Portugal, France, Korea. Just some observations: there was hardly any technology used in the classroom although we all had laptops in our rooms and used them for some sort of looking up and memorizing exercises. The physical environment was just a big table we all sat around and were usually cold or hot. The Japanese don’t put a lot of belief in making the physical learning environment comfortable. We all got the impression that learning for the Japanese was like ‘going to war’. Many times students said they wished we could just sit by ourselves at desks. We watched videos on a wheeled in TV on a cart occasionally just like I remembered doing in the 1960’s in south Georgia. We used the classic foreign language acquisition methodology of the teacher only using the target language (all Japanese all the time) and the students did role-plays, scenes, drew pictures, made newspapers, wrote letters to friends (real and imaginary), made videos and went on little trips to the post office, the corner shops, and so on. We should have spoken Japanese to each other all the time but really we only did haltingly and just used English because it was the lingua franca for the group. There were tests at least once a day and every 3 weeks a grueling 3 hours examination to test proficiency on what had been ‘learned’. I never did very well on any of these tests or examinations. My classmates were not very interested in collaborative type activities and preferred to simply study and memorize alone in their rooms and then go to the local bar, get drunk and forget they were in Japan. I stayed there 9 months and then left to return to Hong Kong. I will forever be able to read and write a simple note in Japanese and order food in a noodle shop when I’m in Japan. I can’t understand very well at all when spoken to but people seem to understand when I say something. I still wonder why I did this but I do have a feeling it was useful in an odd abstract sort of way. I put this in the category of ‘learning for learning’s sake’. Next, I returned to Hong Kong and the winds of the global financial tsunami were in the air. I enrolled into the MSc Knowledge Management Program at Hong Kong Polytechnic University. This is a blended learning programme with some face-to-face activities and some online activities. They were using the WEBCT learning managing system (LMS), which I know now to be rather a dinosaur LMS. I liked the WEBCT and it was interesting to read lessons online and then attend the lectures. The course work was frequently group based. The programme was primarily designed for full-time workers to do over a 2 or 3-year period. I did the whole programme in 15 months full-time just because it was impossible to find a job in Hong Kong at that time. Doing group course work required a lot of time to organize physical and virtual meetings, set deadlines and monitor progress. Some of them were very rewarding and some were very frustrating. Simply put, it all depended on the team. I leaned how to use many collaborative online tools that I would never have used otherwise because of the group course work. I did well in the programme and felt that I had really learned quite a lot about knowledge organization approaches and methodologies. I’m using what I learned in the programme everyday now. Learning technology was well-used even if it wasn’t that most up-to-date and sophisticated learning technology available. The emphasis on group learning was far more important and useful than the technology. The caution is that I really could only learn successfully in a context where it was meaningful for me based on my experience. Using technology was not the significant factor and group collaborative learning was much more important all 3 programmes. Being an English teacher may be useful some day but it wasn’t what I really wanted to do in 2007/2008. Leaning Japanese seemed exotic but the reality was memorizing 3 scripts and hundreds of vocabulary items every week and I couldn’t see any definite end-goal for what I would do with it if and when I learned Japanese. Learning about knowledge management fit into the context of what I had been doing in the records and information management field at New York University, Philip Morris and the HK Chep Lap Kok airport construction project. I learned and could put it into a context of past experience and it made sense to me where I could use this newly acquired knowledge. So if you are going to be an old dog learning something new then I recommend you stay in your field and focus on branching out and widening your horizons in your field. I wouldn’t recommend trying to learn something too radically different because it may not fit in with your view of yourself and you might have a difficult time seeing how you will use this new knowledge. The Toyota recall of over 8 million vehicles in the USA has gripped the news cycle over the last several days. The testimony of Akio Toyoda, President of Toyota, before a committee of the US House of Representatives made for better than average testimony television. As I watched it I thought how different he was from the tobacco executives who claimed that tobacco did not cause cancer or the recent Wall Street executives who plead ignorance of their own operations. It has made me reflect on what I know about Japan and Japan’s influence on knowledge management and some widely held beliefs about the importance of culture and how it impacts behavior in organizations. I’ve been going to Japan for the past 20 years. I’ve got sort of a love/hate relationship with Japan. Its very interesting and very frustrating. I’ve worked and lived in Tokyo twice for a few months each time and for years spent several weeks there each year on flying working visits. I’ve travelled quite a bit over the main island and up to Hokkaido for work and pleasure. I lived in the town next to Toyota in Aichi prefecture from October 2007 until June 2008 attending the Yamasa Institute also known as the Aichi Center for Japanese Language Studies. Okazaki and Toyota are on the outer reaches of the Nagoya suburbs. Okazaki has the family castle for the Tokagawa’s, the shogun, who ruled in the emperors’ name until the Meji restoration. As its name suggests, Toyota is the ultimate company town. It’s quite nice but a bit utilitarian. There is a good museum about Toyota and some very nice public sports facilities. In 1959 the town of Koromo was renamed to Toyota. I was told by my host Japanese family that Toyota bought the city’s name but maybe that was an exaggeration. My host family also said that all of the Toyota directors lived in Okazaki because it was so much nicer than Toyota. As you can see, it seems there is some rivalry between Okazaki and Toyota. Okazaki is a rather nicer small city than Toyota with the castle and a river lined with cherry trees running through it. This is the Japan’s industrial heartland and has not suffered visibly from the ‘lost decade‘. Personally, Japan has never seemed that lost to me. As can be expected, many people work for Toyota and its suppliers in the area. When I spoke in my slow and halting Japanese to people about the Toyota company it frequently seemed to me that there was quite a lot of resentment about the company. It was too big. It expected too much from its employees. During my time there 1 Toyota employee in his 30’s died from ‘death by overwork’ or ‘karoushi’, ‘かろうし’, ‘過労死’. That modern Japanese has invented a word for this kind of death has always stuck me as rather alarming. The company paid the family some compensation. The karoushi and the compensation were not considered unusual. At the same time, people admired Toyota’s success and the roads were full of Toyota cars. The Prius hybrid was rather a menace for students like me on bicycle because they are so quiet they easily sneak-up on a panting bicyclist. I knew one Toyota employee thru a conversation club who seemed happy enough but said he worked too much. I remember him rushing in to our meetings from a Saturday morning quality circle meeting. So what does any of this have to do with knowledge management? Many of the seminal knowledge management ideas from the 80’s and 90’s were highly influenced by Japan’s success and the alarm from the west over what was making this small country so successful. In the 80’s western electronic corporation were being surpassed by Japan’s Sony, Toshiba and Hitachi. One of my favorite lines from a now forgotten Hollywood movie was the answer to this question, ‘How can I understand America?’ — ‘Remember good cheap Japanese electronics’. Detroit ignored the threat and payed dearly 20 years later as their market share was overtaken by Toyota, Honda, Nissan and Subaru. In 1995 Ikujiro Nonaka and Hirotaka Takeuchi published “The knowledge creating company: how Japanese companies create the dynamics of innovation.” In 1998 Thomas Davenport and Laurence Prusack published “Working knowledge: how organizations manage what they know.” In 1998 Hirotaka Takeuchi published a paper “Beyond Knowledge Management: Lessons from Japan.” He emphasized that the western idea on knowledge management put far too much emphasis on management of explicit knowledge and failed to recognize the fundamental difference between Japanese and western concepts on workers, knowledge and how together they create real innovation. Dave Snowden began developing the Cynefin (kun-ev’in) sense-making and decision-making framework in 1999. Dave Snowden likes to say Nonaka’s SECI model was the model that launched a thousand failed knowledge management systems. This is undoubtedly true. The world is now littered with knowledge bases that are seldom used because it is too difficult to find anything and there is little trust in the found knowledge. However, I agree with Hirotaka Takeuchi that people misunderstood what he and Nonaka were writing about and spent way too much time on explicit knowledge management. This happened in both Japan and western countries. I’ve blogged about this here. Japan remains among the most innovative and knowledge friendly cultures in the industrialized world. Its largest carmaker has just suffered a brutal blow to its reputation because of poor manufacturing quality and poor knowledge coordination about the problem inside the company and externally with parts suppliers and governmental regulators. What went wrong and what does it say about how Toyota uses its knowledge and reacts to a crisis? Was it a failure of the Toyota Way? Was it because Toyota grew too fast and too large and what does this tells us about sustainability for very large global companies? Does it tell us that the Japanese manufacturing approach cannot be exported abroad? Does it tell us something about how Japanese culture uses and shares knowledge? What does it tell us about how the Japanese respond to a crises on a organizational and an individual level? I’m going to blog about these issues over the next few weeks.